Not long after moving to US I developed a sudden craving for certain Malaysian/Singaporean food that I wasn't particularly crazy about back home. Is there a medical term for such condition? I generally called it home sick. Back in the days when I was sharing an apartment with my friend Ying, she occasionally brought back homemade goodies made by her "considerate and caring" colleague. The thing is, most of the stuffs she made were, (erm, is there a way to put it mildly) didn't taste like what they were supposed to be. Most of th time, the items would vague resembled what she was trying to make, but taste nothing like it. But they were made with love nonetheless, so I admired her generosity. There was one thing however, that I think she made really well, and that was the steamed golden daikon cake. I was always glad to see Ying came home with a packet of her colleague's golden daikon cake, as opposed to the "skinny version of chinese egg tarts". Being a good friend and a competent cook Ying would then sliced and lightly panfried them with lots of garlic, shallots and sometime toss in an egg or two. Those were the days. The last time when we ordered the golden daikon cake at a local Chinese restaurant, we were appalled to see my beloved dimsum item came drenched in oil, (literally) and fell apart like a piece a soft tofu when I tried to pick it up. "Oh, it's very EASY, just use some X, a little bit of Y, Z, W, X, mix together, then steam. Very EASY. Anybody can make it." "Why don't you just eat/buy from the restaurant? Or just use the ready-mix?" Everything is guesstimated, nothing specific. They presume you have certain level of experience and understanding of how things work. Like them. But I am not good at following vague instructions, although I prescribe them freely to friends who asked me for recipes all the times! Long story short, I tried out a few recipes from Chinese websites which each gives very different directions but none worked. Finally, I stumble one in Bon Appetit. Ah, the end of my daikon cake quest. The recipe provides very clear steps and precise amounts of different ingredients. With some tweaking, it becomes my go-to recipe for golden daikon cake now. To make the golden daikon cake, one has to begin with a trip to the Asian grocery stores. A lot of the ingredients such as dried shrimp, chinese sausages, dried shiitake mushroom and rice flour are not readily available at the neighborhood grocery stores, no matter how well stocked they are. While you are there, do check out the snack section, where you can stock up on Pocky, Calbee's Shrimp flavored chips (I like the wasabi ones), japanese rice crackers, Nissin Ramen Pork Tonkatsu, Shin Spicy Ramen and a thousand and one types of condiments. Well I digress. Once the said ingredients are assembled, here comes the hard work. Using a box grater, grate the required amount of daikon using the side with biggest holes. 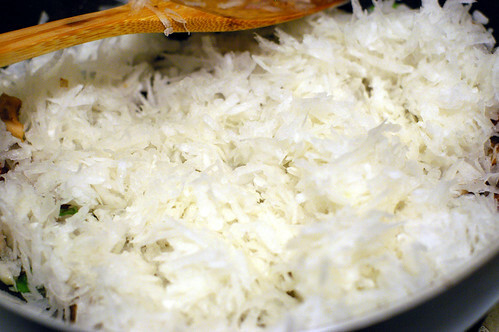 Time yourself and see how long it takes you to grate 1.5 pounds of daikon. It counts towards your cardio exercise. If you have a food processor, spend some time to decide which finger needed to exercise most, and use it to press the grate button. Next, dice the rest of the ingredients. The original recipe doesn't include dried shiitake mushroom but a lot of daikon cake I ate in the past had it as one of the ingredients. So I usually throw in 4 to 5 mushrooms in mine. In the same skillet, stirfry the grated daikon until it turns translucent. (like onion). Stir in the rice flour + water mixture after the daikon mixture has softened. 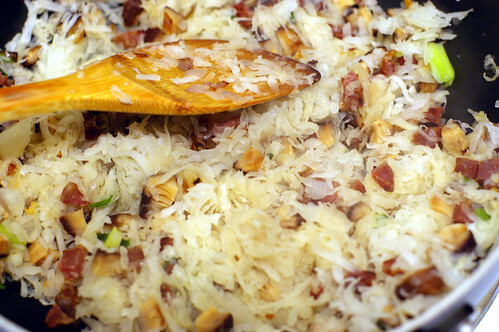 With lower heat, quickly fold in the rice flour mixture. The whole thing will turn into a huge mass of glue in no time. Very quickly, season with salt and pepper before transferring your batter to an oiled pan for steaming. Now you can rest for 40-50 minutes while the daikon cake is steamed. When the daikon cake is cooked, cool and refrigerate overnight before panfrying. We like to pair the daikon cake with hot chilli sauce. Spicy and delicious! 4-5 pieces of dried shiitake mushrooms, reconstituted in hot water for 30 minutes. Fit processor with large-hole grating disk. Working with a few pieces of daikon at a time, place daikon pieces in feed tube and process until coarsely grated. Transfer daikon to bowl. Replace grating disk in processor with metal blade. 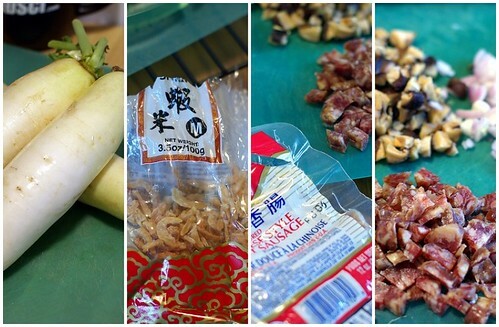 Return daikon to processor and finely chop, using on/off turns. Heat heavy large skillet over medium-high heat. Add sausage cubes to skillet and sauté until fat renders and sausage browns, about 5 minutes. 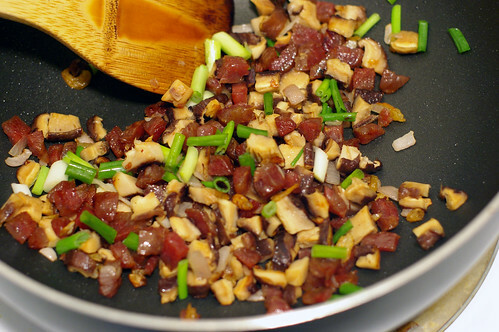 Add green onions, shallot and dried shrimp; stir 1 minute. Add daikon and cook until daikon is soft and transparent, stirring frequently,about 20 minutes. Meanwhile, spray 9-inch-diameter cake pan with 1 1/2-inch-high sides with nonstick spray. Whisk rice flour and water in large bowl until well blended. Pour into the daikon mixture. Season to taste with salt and pepper. Spread daikon mixture evenly in prepared pan. Place cake pan on bamboo steamer rack set over wok filled halfway with simmering water or on metal rack set over simmering water in pot. Cover with lid; steam over medium heat until cake is set and firm to touch, occasionally adding more water to wok or pot as needed, about 45 minutes. Remove pan from steamer; cool cake in pan 1 hour. Cover and refrigerate daikon cake in pan overnight. Whisk soy sauce and sesame oil in small bowl. Heat 1 tablespoon vegetable oil in small skillet over medium heat. Add cilantro, ginger with juices, and chiles or hot chili sauce; stir 30 seconds. Mix ginger mixture into soy sauce mixture. DO AHEAD Daikon cake and sauce can be made 2 days ahead. Cover separately and refrigerate. Run small knife around daikon cake to loosen. Invert onto cutting board. Cut cake into 1/2-inch-thick slices (not wedges), then cut each slice crosswise into 2-inch-long pieces. Heat 1 tablespoon vegetable oil in large nonstick skillet over medium-high heat. Working in batches, add daikon cake slices to skillet and cook until golden brown, adding more oil to skillet for each batch as needed, about 5 minutes per side. Transfer slices to platter. Sprinkle with sesame seeds. Serve herb soy sauce alongside for dipping. OMG! I am hungry again ans it is time for bed...Gorgeous! Oh it is REALLY A LOT of HARD WORK! Loh Pak Go is my fav dim sum item! Whenever I go to Chinese dim sum restaurant, this is my must-order. It don't turn out perfect everywhere though. This is simply making my mouth water! mandy - thank you so much for posting this recipe. I always order this at dim sum and have always wanted to make it. Now that daikon are in season here, I'm sure I'll make this soon. Thanks again! Wow! I'm impressed by your quest for the perfect daikon cake. I can't even tell you how excited I am to see this post! I love this stuff. It's the one thing we always have to have at dim sum. 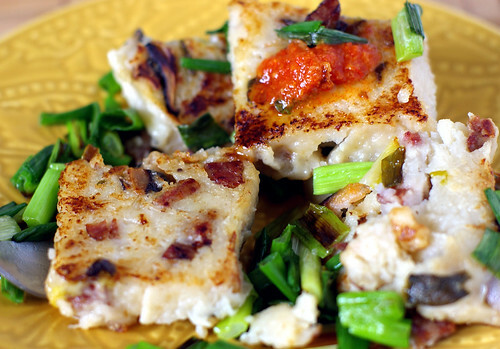 The first time, they called it a "steamed radish cake," and since we couldn't imagine what that was, we had to try it. I didn't imagine it could be made fairly simply at home. I have to try it, and I love your great step by step photos. Seriously, I'm so happy you posted this! Man, I love these. I wish I had to make them. One rainy day I just might have to...Delish! 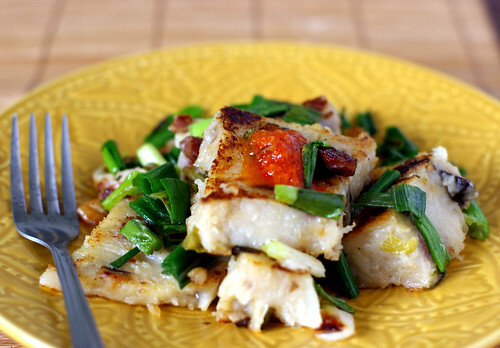 Fried radish cake is one of my all time favourite yum cha dishes, and yours looks absolutely delicious! This is one of my favorite dim sum dishes too! Your pictures are so well taken that I literally want to take it from the screen and eat it! YUM! What a fascinating recipe! I too miss certain foods from home, which explains why when I visited family last month I returned with 33 lbs of "home food." I've never had this before but your photos are stunning and make me want to give it a try! They look so yummy! Makes me crave for dim sum now. It's strange that I've never eaten such cake, I should keep a look out the next time! Mandy, your Lor Pak Ko is soooooooooooo (slurp..) mouth watering, you're killing me here, girl! I want it now!!! my dad always made loh bak go after our CNY eve reunion dinner. in recent yrs, i've tried to continue the tradition but my kids don't seem so crazy about it. ah, maybe like me they'll like it when they r older.u coming back for CNY? Thanks for the photos illustration. It's really wonderful and makes me want to have a slice! Oh this is lovely! hahahaha so delicious looking fellow, sure I will wallop them one by one! This looks SOO good, and not that long or hard, except for the grating, I'd love to give it a go. That is one good delicious looking Loh Pak Koh!!! I just bought a Daikon yesterday from Chinatown thinking of making this and now you post the recipe. I am so doing this. Thanks for sharing. wow...the colour and the garnishing look so tempting!!! U r a great chef!! thanks for your kind words. I bet all the loh pak go in Taiwan are to-die-for! OCT says the same thing too! thanks! I hope you get to try your hands at making daikon cake sometime! And let me know how it works for you. I am sure yours will be stunning, should you decided to make it one day. Let me know how yours turns out, ok? thanks! I want to conquer char siew pao next! I can totally understand that. I am going to do just the same when I go home in 1 weeks time! lucky you! Actually this is "sap sap sua" (easy job in Cantonese) compared to all the yummy food you made! you must check this out the next time you go to any chinese restaurants that serve dim sum! thanks! I will trade this for your prawn noodle! wow, what a coincidence! I hope you will like this version. 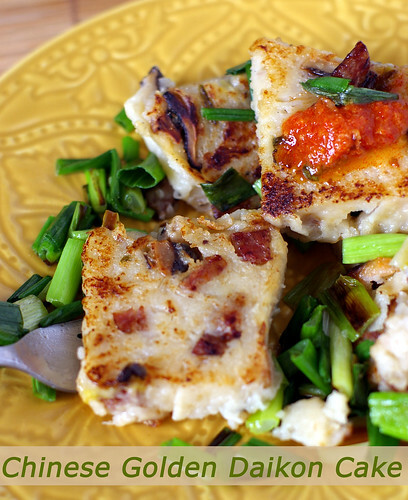 1. are you using rice flour or glutinous rice flour. The recipe calls for rice flour and I accidentally used the glutinous variety once and it never get hard at all. 2. did you refrigerate the cooked cake overnight? It would be too soft if not chilled properly. 3. How long have you steam the cake? Did you test for doneness first before removing it from the steamer? The tester should come out clean when the cake is done. wow what beautiful pictures and those look so delicious. I tried this recipe and it is so tasty. I'd probably try to steam it in a square or rectangular pan next time, only because I want the pieces to be rectangular. Cheers!